Painting on a plane is a fun and zesty enterprise, but it does come with pre-requisites of certain technical skills. Luckily, these skills are natural-born to you as a human, so no need to practice before hand. To satisfy the “how do you do that” question as a reaction to any pictures I post on social media of my on-plane painting studio, I have a 9-step chronological process in which to accomplish this type of divertissement on any flight. And to be more specific, you’d be wise in this window-seating assignment if you choose the “A” seat if you’re left-handed or the “F” seat if you’re right-handed. I am right-handed, so I prefer to sit on the right side of the plane, where no one is sitting to my right, and thus I eliminate an accidental bumping and provide myself with just enough elbow-room oscillation. After passing through all security checkpoints, buy a bottle of water and drink at least a quarter of it before getting on the plane. If you’re really smart, you’ll go through the security checkpoints with an empty bottle of water that you can fill up at a drinking fountain near your gate. A nod to the 3 R’s to remember to help our planet. But don’t fill it up all the way because this will go between your legs on the plane, and that kind of squeeze could make too-full bottles spill over and make it look like you peed your pants! Yes, I did learn this the hard way. Choose a carry-on bag (or have this be your purse) so that it fits under the seat in front of you. This way, you never have to get up out of your seat to reach your bag in the overhead bins. Your first opportunity to paint is when the plane reaches altitude, and sometimes the captain doesn’t turn the seatbelt sign off at that time. Having your goodies readily available eliminates this worry and maximizes your painting time while in-flight. Plus, it’s svelte this way. To ensure art-journaling success, it is absolutely essential that your nice, friendly, talkative, interested neighbor not talk to you during the optimal painting time on the plane. This kind of distraction might make you not be able to paint at all because you’d feel rude or guilty having to ask the person to leave you alone while you concentrate. So, you end up having small talk and then the drinks and snacks come and then you’d feel like you’re running out of time after that. So, before you get out your journal and paints, let it be obvious that you’re putting on some headphones, then put on your jams, and get started. 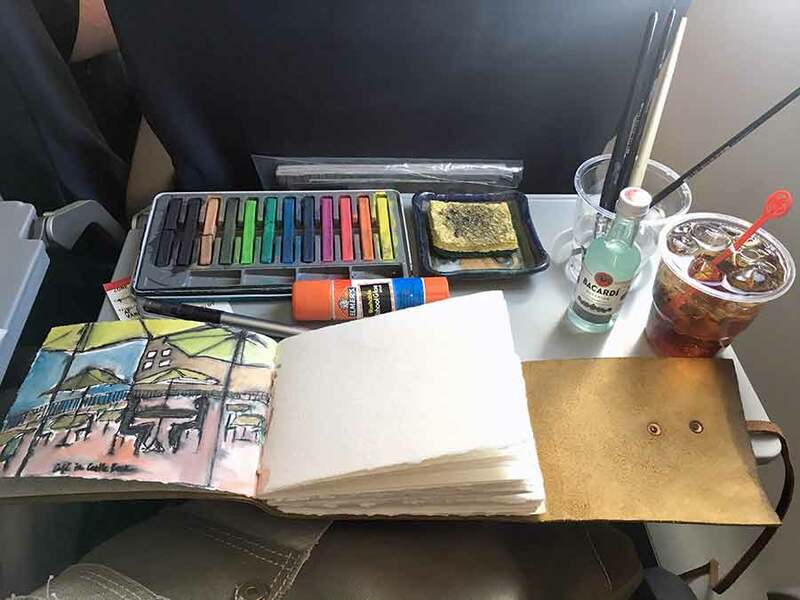 Once the plane has reached altitude and before putting the tray down, grab the following items out of your bag: water bottle, paintbrushes, pencil or water-proof pen (Uniball), your paints, a small dabbing sponge, your journal, and your wallet if you plan on purchasing a little liquid inspiration. Once you have these items in your lap, put the tray down and set up your station. I like to use Derwent Inktense blocks or watercolor cakes. Tubes of wet watercolor are suspicious to security, they’re messy, and they take up a lot of room! Keep it simple. Put your mind to it and create some super-sweet journal pages! Grab some water onto your brush, pick up some paint from your travel palette, and slap it on the page. Dab off any excess water from your brush onto your sponge or use your sponge for some cool texturing. Take time to peek out the window for inspiration or for cool views. Enjoy the music serenading this experience. Make any turbulence be your friend and create an airborne abstract. This skill we all know how to do already, but for some reason, it happens time and time again. After the flight attendant delivers your cocktail and you take up the last remaining spot on your tray, your every movement needs to be deliberate. And, if turbulence happens, let it be known that when you grab your cocktail first, it isn’t because you love your alcohol, it’s because you’re protecting your journal from having undesired character. When the flight attendants announce that you are on your initial descent, you have about 15 minutes until your trays REALLY do need to be up and your bags BETTER be re-stowed. So, paint your last bit when the announcement comes on and let your journal page dry before closing the book. But DO NOT take your headphones off at this time…use this 15-minute drytime to relax, admire your work, reflect, and visualize your near future. If your curious neighbor decides to pry and ask about your journaling expertise, you may choose to engage and respond, in which case, you’ll be you. And there are no guidelines from me on that one. But just be prepared to be asked. It almost always happens! Copyright © 2018 Mind's Eye Journals. All Right Reserved. Journaling is good for the soul...and for those souls that will study & follow us after we've left our stories.